SAN ANGELO, TX — This year the Rams Blue and Gold Spring Football Game kicked off with a special celebration and opening ceremony at LeGrand Stadium at 1st Community Credit Union Field, 2302 Phil George Drive. Dr. Brian J. 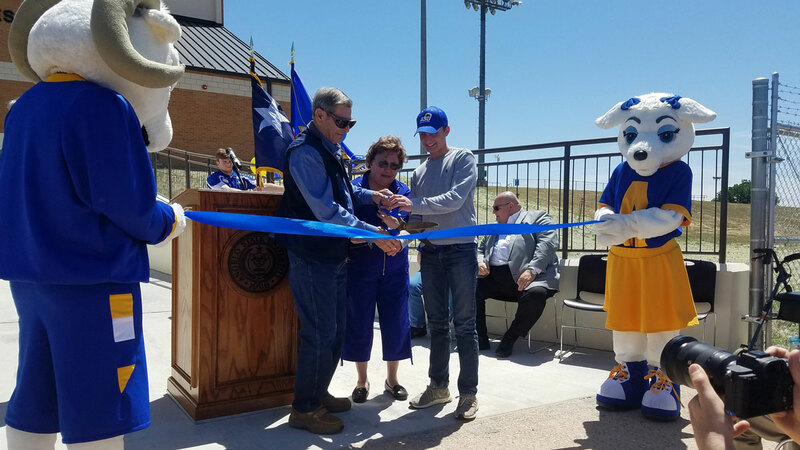 May, president of Angelo State University, led the program at 12:30 p.m. Saturday marking the grand opening of the Mayer Press Box. Richard Mayer introduced his wife Betty "B.J." Mayer. He referred to the Mayer family's early ties to Angelo State and its long-standing commitment to higher education. The Mayers donated funding for the new press box that replaced a much smaller building built in the 1970s. The 7,300-square-foot facility houses restrooms and concession stands on the first floor, media and VIP suites on the second floor, coaches’ and VIP suites on the third floor, and a video deck on the roof. Angelo State Athletic Director James Reid and Head Football Coach Will Wagner both expressed their gratitude for the Mayer's generosity and noted the new press box transforms the entire football and track facility into one of the finest in Division II university athletics. The press box was approved by the Texas Tech University System Board of Regents at its May 2016 meeting as part of a $99.7 million capital projects plan for the Angelo State University campus. Regent Mickey Long, who is a 1976 graduate of Angelo State, attended and spoke today on behalf of the TTU System. The Rams spring football game Saturday was played under the shadows of the new press box.